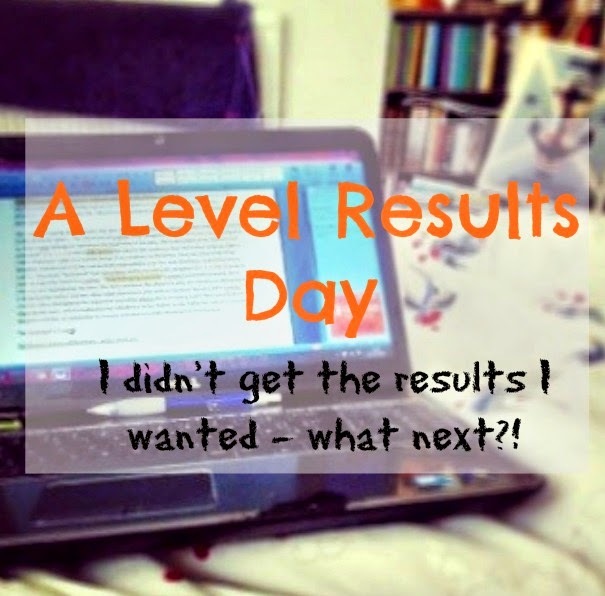 The 14th of August 2014 is A Level results day in the UK. This means many young people up and down the country are either feeling elated or disappointed. I know I was feeling the latter when it was my results day but three years later I've learnt that doing badly in your A levels is not the end of the world. I've put together this post to give you some advice and tips and what to do next if your results are not what you expected or wanted. First of all, do not panic. Yes, things haven't gone exactly the way you planned it to but you will soon come to realise that this happens quite often in life and we just have to get on with it. The less time spent being upset and moping over it the better. I'm not saying don't feel down about it, I certainly did and sometimes do to this day on, but the sooner you come to terms with your results the better you can sort the situation. If you applied to a university and they say they rejected your offer because of your results, call them up. They may still have some places they can offer you with one less grade. It's a simple solution that could potentially reverse a somewhat disappointing day. If they can't accept you then make sure you are in clearing and looking at places. Don't make the mistake of accepting the first offer that comes up; you've just put a year into planning your university place so it makes no sense to just go along with the first place that crops up. If I could go back in time to my clearing I would tell myself this: If you are really unsure take a year out. You are young and have plenty of opportunity to go to uni at a later date and do something your heart is 100 percent in. I loved my degree but I wish I could have had chance to look at other unis or take a year out and think hard about what I wanted to do. Don't dictate your whole life on one day just because it is the day your results get released. You can always consider re-doing some A Level modules too or, if you fancy a change, go to a new college. You are not a failure if you go back and re-sit exams, you're just taking a different route on your journey to university or work. Most importantly; do not listen to others. I remember when I came home after getting my results I cried for about 3 hours then my Dad came home and shouted at me so I cried again. This is not productive. People, especially the ones who love you like my Dad in my case, will have opinions on the matter which will change the way you think but it is so important to remember it is your life and you can do exactly what you want to do with it. Other people won't understand how you feel. My Dad was angry because he thought I'd just given up and not attempted to reach out to any unis. He didn't realise how upset and confused I actually was and, after speaking to my Mom, he was much more supportive of my decisions which brings me to my last point; talk to your friends and family about the situation. Talking helps when your upset and may make you see the world from another point of view. I didn't get accepted into university. I now have an honours degree, a full time job and I'm hoping to start my own business. A Level results are not the be all and end all of your life; it's just a way to help guide you to your next adventure.